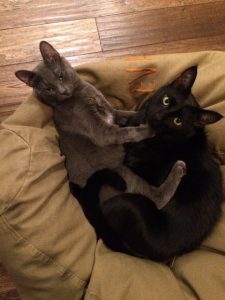 “The cats we adopted first from Furry Friends (Apollo and Arrow) already had those names, and because we liked them, we kept them,” says Monica. 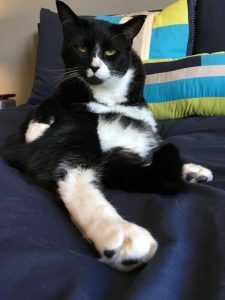 “When we first found Lily, we didn’t know whether she was male or female, but once we learned she was female, we decided that Lily would be a great name for her. “Initially, we chose Arrow because he was very playful and friendly. We had to adopt both cats since they were brothers, and although neither of them adapted to their new home immediately, Arrow was faster and Apollo was shier. Then, once Apollo grew more comfortable with us, he became one of the most loving cats in the household. “They’re wonderful companions. Sometimes, they just want to sleep/relax, while other times, they beg us to play with them and give them attention. They love to play and always spend time with the family at night when we watch TV. Apollo loves to lie on our laps while we sit on the couch and Lily sometimes does too. We often have to get up earlier than we’d like, however, because Arrow wakes us in the morning for breakfast by rattling the bedroom door handle! 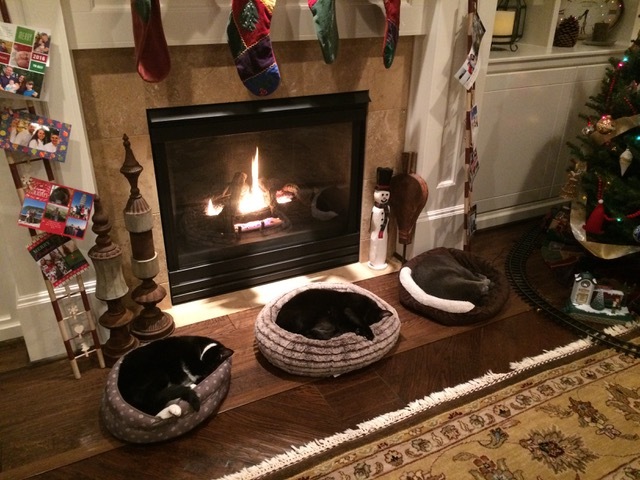 “When we first got Lily, the cats were a little uncomfortable, but they’ve gotten used to her. Arrow doesn’t always agree with her while Apollo is usually fine with her, although he sometimes gets a little jealous when I spend time with Lily instead of him. “While none of them play with cat toys, Apollo likes spending time with his stuffed dog and mouse, bringing them everywhere he goes and sleeping with them. What he does play with are plastic straws. He’s figured out how to open the kitchen drawer and pull out a straw! Sometimes he’ll even play fetch with you. Arrow loves these long, thin wooden sticks as well as ribbons. He loves to chase after them and really enjoys licking them, while Lily will play with just about anything. If she finds something small on the ground like a button or Lego, she’ll happily bat it around. “All three love being petted, cuddled and scratched behind their ears and on their noses, but Arrow enjoys it the most. He loves belly rubs, lying on his back, stretching out, and purring super loud when we pet him.